Have you heard? The popped collar is coming back. 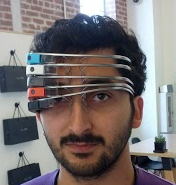 But that's sooo last year now that we have Google Glass. Presenting: 5 popped Google Glasses (combined current value of $7,500 or more like $8k if you count taxes), because having 4 popped Glasses on isn't nearly as cool. Left part of the image credit: Someone on the Interwebs, who the hell knows.